Just wanted to give everyone a thank you for praying for little Silas Dillinger. He is the sonof Emily and Josh. . .the baby. surrounded a camp fire. . .burning his little hands. Silas had to be life-flighted to the burn center in Louisville, Ky.
His parents and grandparents had to follow in their cars. . .
thus little Silas would get to the hospital before his family. . .
seemingly all alone. . .
but when he got there he was welcomed from people from the church in Louisville. . .
they held him and prayed for him until his folks arrived. When Emily and Josh drove up to the hospital they didn't know if they were at the right place so they rolled down the window asking a man who was standing out front. "Is this the hospital for the burn patients? My son was life-flighted here. . ."
the man said, "Are you the mother of that little boy who burned his hands? He is adorable and he is doing fine. . .he is in room #. . ."
holding Silas in her arms rocking him in the rocking chair. . .
with other folks - Ben and Bethany Voit - there to pray and give them support. Emily was so filled with gratitude! And the church had an apartment for the family to stay in while little Silas was in the hospital! God's people are so good. . .we really do have a "family of a different kind". God just blesses us even when the day is dark and it seems like we can't find any light. . .
Then He lights candles for us and helps us see we can trust Him! He is able to make our trials a blessing. He is able to inspire us to do our best in the future and be ready to help others when they have a need. 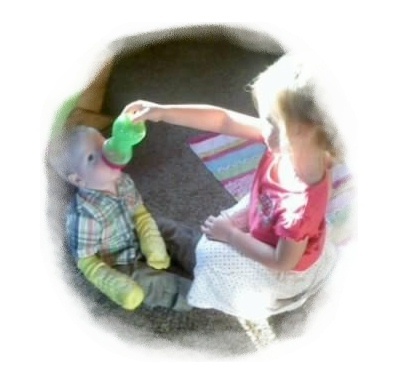 Big sister, Eden feeding little Silas at home. Little Silas was first thought to have 3rd degree burns, but later they found most were just 2nd degree burns as they blistered up. . .that was a good sign. He was treated and able to go home on Monday. This accident just happened Saturday night, so that was an answer to prayer. The doctors are pretty certain there will be no lasting consequences to Silas' hands. . .he is getting better everyday! always able to give us what we need to help us endure or make it through. We can trust Jesus. . . We can trust Jesus. . .We can trust Jesus! 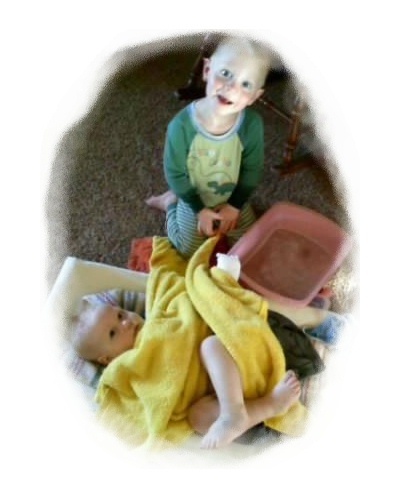 Levi helping Silas with a sponge bath. Levi said, "My new baby brother home from the hospital. . ."
Now to him that is able to do exceeding abundantly above all that we ask or think, according to the power that works in us,Unto him be glory in the church by Christ Jesus throughout all ages, world without end. Amen.